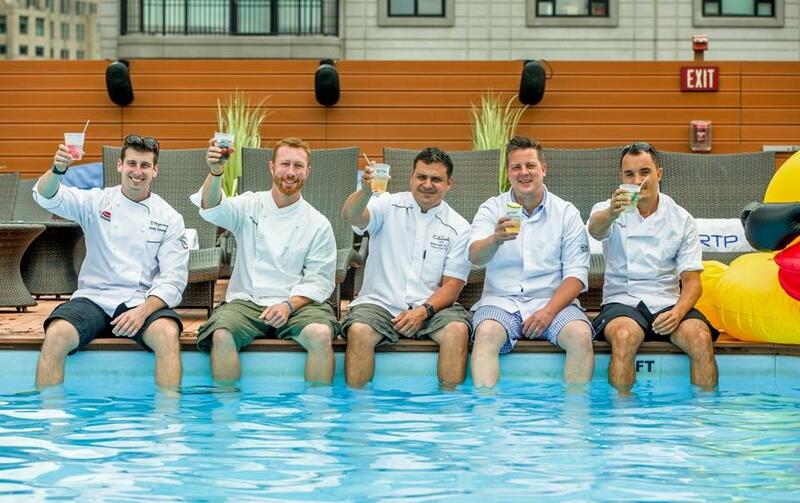 Chefs participating in weekly poolside pop-ups at the Colonnade Hotel this summer include (from left) Chris Coombs, Evan Hennessey, Nick Calias, Matthew Gaudet, Allen Campbell. It’s Tuesday night and it’s too hot to cook. And wouldn’t a dip in a pool feel really, really good right now? For $20, get dinner and a dip and a chance to mingle with a local culinary star at the rooftop pool (a.k.a. RTP) of the Colonnade Hotel. From now through Sept. 13, the Colonnade’s executive chef Nick Calias has invited some of his cooking comrades for a weekly poolside pop-up. The guest chef will create one to three small plates (perfectly-paired cocktails will also be available) for pool deck noshing. Calias will whip up a little something, too. And here’s the kicker: One hundred percent of all proceeds will benefit Share Our Strength No Kid Hungry. Let’s just say that the food goes beyond typical backyard BBQ fare. On July 19, participating chef Matt Gaudet of Superfine Foods served up whiskey-glazed St. Louis ribs, grilled vegetables with salsa verde, and chickpea crumble. Calias added Vietnamese spring rolls and duck confit with lemongrass ponzu. The following week, chef Evan Hennessey of Stages at One Washington in Dover, N.H., was set to cook up white Pekin duck rillettes with yolk sauce, pickled cabbage with seaweed-enriched duck stock and house-grown herbs, and fermented blueberries with Camembert fondant. Coming from Calias: tea-smoked chicken, pistachio, feta, piquillo pepper and bitter greens with oregano vinaigrette, and churros with house-made chocolate sauce. Of course, everything tastes better with a great view, and it doesn’t get better than the 12-stories-up vistas from the Colonnade’s rooftop. “It’s an oasis above the city,” says chef Andy Husbands (Tremont 647, Smoke Shop, Sister Sorel), who’ll show up to cook on Sept. 6. No need to stress about dress; swimsuits are proper attire. Now repeat after us: When I come home feeling tired and beat/ I go up where the air is fresh and sweet. Tuesdays from 5:30-7:30 p.m. $20 per person covers pool entrance and food; all proceeds benefit Share Our Strength No Kid Hungry. For tickets: rooftopchefs.eventbrite.com.